Jason Isaac represents the 45th House District of Texas. Jason Isaac, a fourth generation Texan, resides in Hays County with his wife; the former Carrie Crain, an accomplished tri-athlete, housewife, and community volunteer from Humble, Texas. They have two boys who attend Dripping Springs public schools. They attend Westover Hills church and work tirelessly in support of the community, the state and the nation alongside their close family and many loyal friends and supporters. Since working his way through college at Stephen F. Austin State University and graduating in 1996, Jason’s career has been focused on increasing the efficiency and profitability of transportation companies while significantly improving their safety record. He is currently a transportation consultant focusing on safety, compliance and operational efficiency improvements within the trucking industry. This experience coupled with his involvement with the Texas Motor Transportation Association has made him acutely aware and sensitive to the safety issues facing today’s traveler. He also owns and operates a small sports management business. The importance of giving back to the community is a key value of the Isaac family. Carrie serves on the board of Helping Hands – Dripping Springs, a non-profit food pantry, and volunteers at a local nursing home. While in high school Jason volunteered to coach youth basketball and there began his passion to make a difference. Since his graduation from SFA, he has continued to volunteer countless hours working with Texas’ most important asset: our youth. Jason has been a volunteer youth sports coach for over 10 years and is actively involved in two non-profit organizations: he is a board member on the Dripping Springs Youth Sports Association and the President of the Central Texas Chapter of US Lacrosse. As he pursued a degree in business, Jason became actively involved in issues facing women and children in Texas, working with such organizations as the East Texas Women’s Shelter and the East Texas Boy’s Ranch. He founded the SFA Lacrosse team and was co-founder and the first director of the Association of Sports Clubs at SFA. He was also a charter member and president of his fraternity. Jason worked, borrowed and utilized grants to fund his education and is keenly aware of the financial difficulties facing many high school graduates as they look to further their education. Education is the foundation upon which progress and prosperity is built and we need to increase access to funding options for our high school seniors. "I think any attempt that we can make to increase the integrity of our elections, the more people we're going to have participate in the process…I don't like to play sports with people that I know are going to cheat." 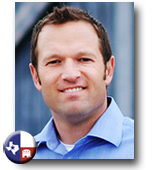 Make sure to check out Jason Isaac's exclusive interview with TexasGOPVote.